A little bear is bored and has no idea what to do with himself. He tries to find a friend to play with him, but no one is around or available yet. Dejected, the little bear lays down on the ground with nothing to do but to stare at the sky or the grass. How boring! Slowly, though, as he sits still, the world begins to come alive around him and his senses are awakened. The grass and the forest around him and the sky above him seem like a very different place and the bear finds himself full of curiosity. He sees things he hasn’t seen before like the shapes in the clouds and feels things he hasn’t felt before like the vibration of a bird’s wings. I Am So Bored! by Henrike Wilson is an adorable book! I really love how this book teaches kids to slow down and look at the world around them. I also love that it teaches them to enjoy the things around them. 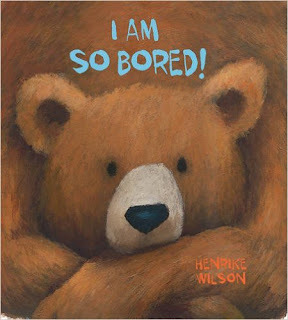 My kids are always saying they're bored so just this past week I've been telling them to do what the little bear from this book did and it actually worked. My kids sat outside peacefully looking and the sky and the birds in the trees. They came in from outside and told me about everything they heard and felt. They were actually outside when it began to sprinkle so they loved telling me all about the tiny sprinkles they felt. I Am So Bored! by Henrike Wilson also teaches kids to use their imagination when they're bored which is a great way to play! I absolutely adore the illustrations throughout this book as do my kids. I Am So Bored! by Henrike Wilson is a terrific book and I highly recommend it! You can find I Am So Bored! by Henrike Wilson on Amazon, Barnes and Noble, Goodreads and other bookstores.